Evolve Group is looking for investors in their Poolrite business to enable it to grow and achieve its full potential. In a move spurred by an increase in enquiry to Poolrite over the past six months, Evolve engaged its mergers and acquisitions team to seek a strategic investment partner. The aim is to equip Poolrite with the resources to handle the envisioned long-term, sustained growth. To facilitate this, Evolve will establish a dedicated entity to own and operate Poolrite’s IP, equipment and assets – and ensure that the new Poolrite business can operate independently from Evolve’s diversified and sometimes competitive resource pool. Australian pool and spa equipment manufacturer Poolrite was founded in 1978. It was acquired by The Evolve Group in 2013 after Poolrite had gone into administration. Evolve Group managing director Ty Hermans say that now is the perfect time for Poolrite to gain increased market share. “There’s no two ways about it,” says Hermans. “When Poolrite folded, a couple of the big players did very well. A few key players picked up most of that business, and while we’ve been steadily regrowing it, the opportunity is there to get that business back and more. He says the right investor may come from the pool and spa industry, or may be a private equity or venture capital organisation. “We’ve already had responses from industry players and also from non-industry players,” he says. “It makes sense for someone in the industry to pick it up, but there’s absolutely a private investment play there as well, given we’re happy to be as involved or as uninvolved as the investor wants Evolve to be in the future operation. Hermans says that what Evolve does is develop and commercialise products. “Poolrite was an opportunistic acquisition, based on the fact we saw a lot of plastic going into the products that we could manufacture in our facility. Our focus was to build the foundations back up again. Last year, Evolve brought in Dale Collins as national sales manager. Hermans says stability of the supply chain is paramount, and they will be working around the clock to ensure that there is no disruption to supply. “When the new entity is operational we will ensure all customers have ample time and preparation to cut across to ordering from the new company,” he says. 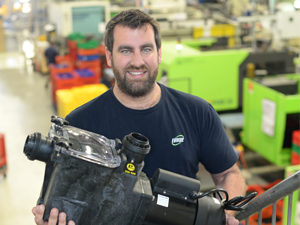 “I believe ensuring Poolrite is equipped for long-term growth, and ensuring it is able to continue to launch innovative and iconic swimming pool equipment is something each and every one of us in the industry should be extremely supportive of,” he says. He believes this is a very exciting time for Poolrite and Evolve, and says his entire team is proud of what they have achieved with Poolrite to date, and where they will take it into the future. See a timeline of the Poolrite brand.